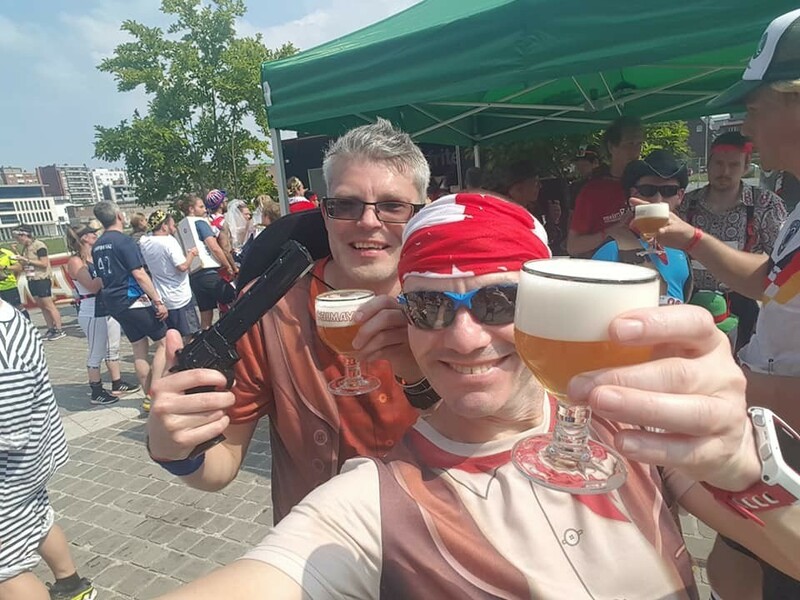 After running the Medoc Marathon back in September 2017 this was on my radar to do and entered as soon as entries opened, only in it’s third year being held and only having a limit of 1500 places how could I resist a run with beer and music involved? 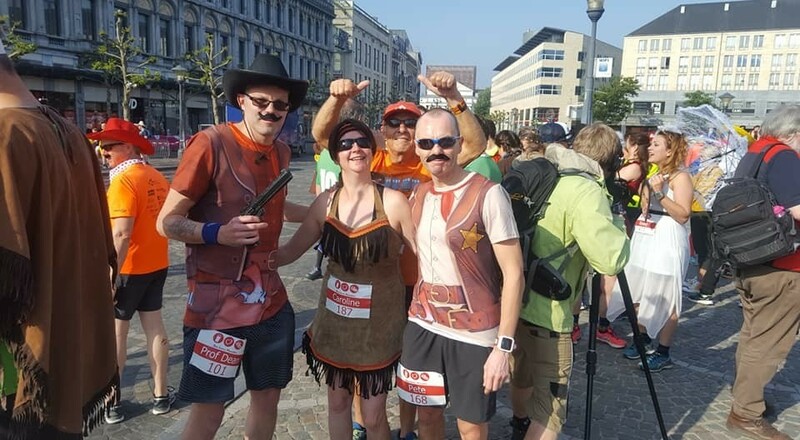 On to the weekend where I was accompanied by fellow Roadrunners Pete the Train Morris, Caroline Hargreaves and adopted Roadrunner Pete Bowles we all booked to go on the Eurostar which was dead easy from St Pancras to Brussels, then onto Liege which was about 3 hours in all. We arrived Saturday afternoon with another short journey to Palais by train with only around 400m to walk we were right by the expo and very close to our Ibis hotel, so no logistical drama’s this weekend, wallet, passport, phone – check!! Numbers picked up and bib number photo done, hotel check-in and back out for a few beers and to watch the FA cup final, which the winner was coincidently scored Belgian Edin Hazard. In the evening we went out for a meal, most of us had steak and chips (which seemed a good choice as this was a fun run and nothing more), just as well it was a fun run as me and The Train ended up staying out late and going to the beer festival that was going on at same time. Race day was a 9:30 start we only had a 5-minute walk to the start line by the expo, ideal as The Train was a bit hungover and I was feeling a bit de-hydrated. We got up at 8am and got ready to go with a fancy-dress theme of cowboys and Indians, Pete seemed to forget his outfit? We met up with Caroline dressed as Indian and Pete B another cowboy. 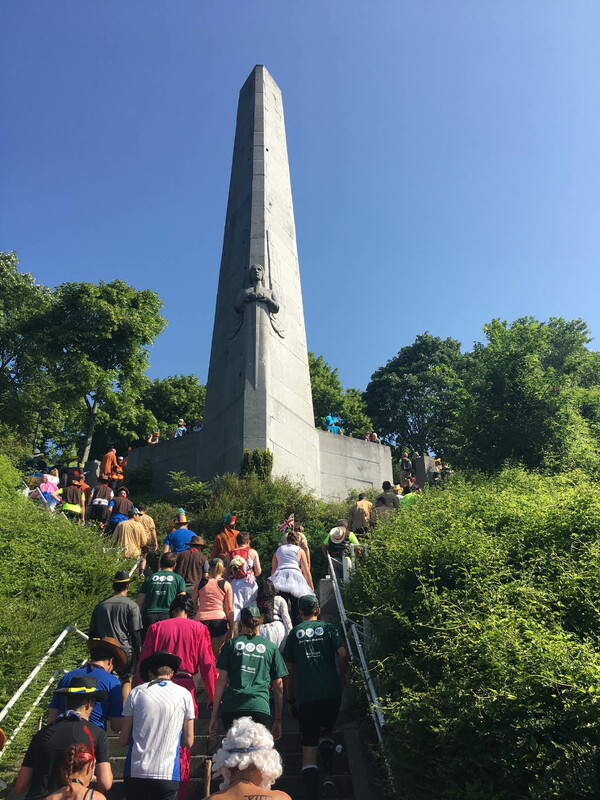 So a bit about the race, the first 10k was mostly uphill with over 500 steps to climb getting some great views of the city. 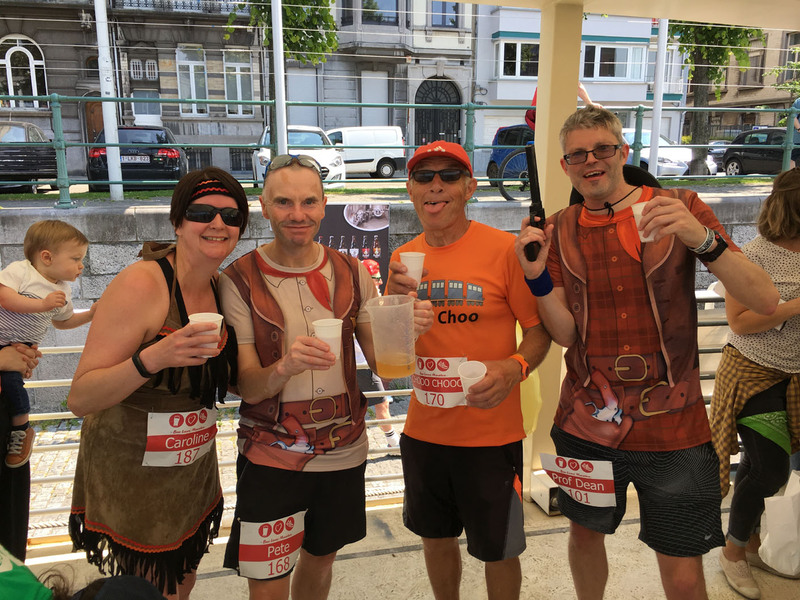 I think I drank more water to re-hydrate here, with 14 more beer stops to come of the best Belgian beers ranging from 5-9.5% and aid stations every 4k or less well stocked with cheeses, fruit, biscuits, white pudding and other savoury snacks. The route was then was mostly flat with nice parts along the river with music playing, it made for a great atmosphere, I had a water pistol gun which helped on a hot day too. We had so much fun and we all just about beat the cut off time of 6 hours 30 me and Pete B 6:27 and Caroline and the Train got in just under 7 but I think there was still quite a few finishing behind us. We then had an after party which you got a free meal of chilli con-carne and yet more beer and music being played. A great weekend had by all and a most do for any beer lover!! !